Ethnobotany: the scientific study of the traditional knowledge and customs of a people concerning plants and their medical, religious, and other uses. When researching local plants and their uses I came across Nancy J. Turner an ethnobotanist and emeritus professor (retired professor) at Uvic who has worked with First Nations elders for over 40 years to help retain, document and promote their traditional knowledge of plants and habitats. Nancy has authored, co-authored or co-edited over 20 books about Indigenous foods, material, medicines as well as language and vocabulary relating to plants and their environments. 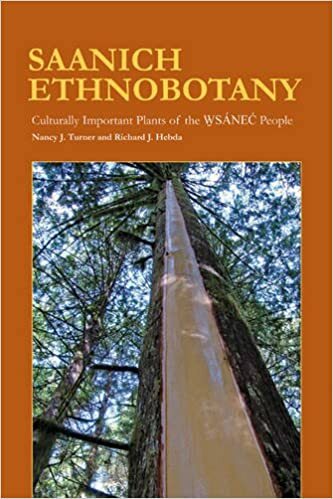 I have decided to use one of her books Saanich Ethnobotany: Culturally Important Plants of the W̱SÁNEĆ People as a handbook for my inquiry journey. W̱SÁNEĆ elders Elsie Claxton (Tsawout), Dave Elliott Sr. (Tsartlip), Christopher Paul (Tsartlip), and Violet Williams (Pauquachin) who share their knowledge of habitats, characteristics, qualities and names of over 150 plants found on the Saanich Peninsula. The book has color photos for each plant making it easy to identify them. This book will help me gain insight into an ancient worldview of the plants that sustained the W̱SÁNEĆ people in the place that I now gratefully call home.